The more science discovers about dental amalgam, the more individual patients are questioning the use of this material to repair tooth damage. Amalgam dental fillings may be referred to as “silver fillings,” but these restorations actually contain a mixture of metals that are bound together with mercury. Fifty percent of an amalgam filling is, in fact, mercury. Although amalgam fillings have been the standard of practice in general dentistry for over a century, there are many good reasons to avoid the use of this material. Patients of holistic-minded dentists are able to choose alternatives to amalgam dental fillings. Even more importantly than having choices for new fillings, patients also need to know they have choices for the removal of existing amalgam fillings. To date, mainstream dentistry frowns upon the removal of amalgam fillings unless the filling has fractured. 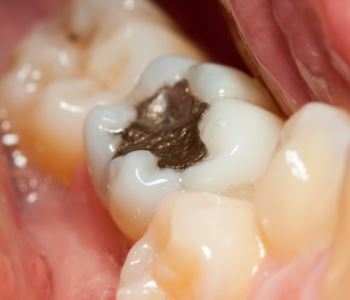 There is good reason to avoid handling amalgam fillings. Without proper techniques, the removal process exposes patient, staff, and the environment to toxic mercury. Data exists showing a direct link between amalgam filling removal and subsequent illness in the treated patient. Even in the face of significant risk, there are general dentists who remove amalgam fillings regularly, paying no attention to excessive exposure. In many cases, damaged amalgam fillings are removed and then replaced with more amalgam! The problem with removing amalgam fillings is that, when warmed, mercury is released from the filling material in tiny particles and vapours. The standard removal process simply drills away amalgam until none remains. Clearly, millions of particles will be released in the immediate vicinity of the patient’s and the dental staff’s noses and mouths. Easily breathed in, mercury vapours will travel to the lungs and blood stream, where they can cause a number of unpleasant problems. Regardless of the material used to replace an amalgam filling, the standard removal process poses a real health risk. Dr. Rose is one of a group of dentists who recognised the immediate and long term dangers of mercury exposure. In addition to avoiding the use of amalgam for tooth repair, our practice follows a strict protocol in order to achieve safe amalgam filling removal in our Melbourne area offices. In the eyes of your holistic dentist, oral health is a critical component of general health and wellbeing, and the dental materials in your mouth are critical to your oral health. To experience the benefits of holistic dental care, contact Smile in Style in Moonee Ponds or Sunbury.